HONG KONG — Most Asian stock markets fell Friday amid more corporate gloom and worries that a key U.S. jobs report could show recession in the world's largest economy is deepening. After fluctuating in the morning, markets trended down later in the session as investors awaited closely watched non-farm payrolls data, due out later in the U.S., that's expected to reveal massive job losses as the global downturn leads companies to lay off workers and curb hiring. Economists predict the American economy shed 550,000 jobs or more, with the unemployment rate jumping from 6.7 percent in November to 7 percent in December, which would be the highest in more than 15 years. 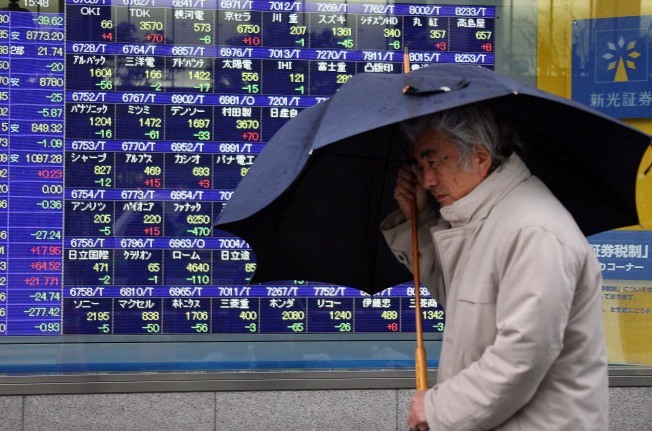 Dismal corporate news out of Asia also weighed on investors. In Japan, electronics component maker TDK Corp. said late Thursday it would cut 8,000 workers and post its biggest net less ever this fiscal year. South Korean automaker Ssangyong Motor announced Friday it applied for protection from creditors to buy time to restructure, calling the move an "unavoidable choice" as it struggles with a liquidity crisis. "Basically there's not much direction," said Francis Lun, general manager of Fulbright Securities Ltd. in Hong Kong. "People still fear the market will go down. All the economic figures show the global economy is in a mess, it's not going to climb out anytime soon." Tokyo's Nikkei 225 stock average moved in and out of the green, trading 39.62 points lower, or 0.5 percent, at 8,836.80 by the close. Hong Kong's Hang Seng Index lost 38.47 points, or 0.3 percent, to 14,377.44, after rising earlier in the session amid what analysts said was speculation about central government aid for the power sector. In South Korea, the Kospi shed 2.1 percent even as the country's central bank cut its key interest rate for the fifth time in just three months to help shore up the country's sagging economy. Benchmarks in India, Taiwan and Singapore sank, while those in Shanghai and Australia advanced. Overnight in New York, Wall Street closed mixed after lawmakers and Citigroup worked out a deal that could support the battered housing sector by limiting the number of mortgage foreclosures. Sentiment was hurt after Wal-Mart Stores Inc. issued a profit warning and reported dismal sales for December, heightening fears that consumers are faring even worse than thought. The Dow ended down 27.24, or 0.31 percent, at 8,742.46 after being down as much as 119, but broader stock indicators climbed. The Standard & Poor's 500 index rose 3.08, or 0.34 percent. U.S. futures pointed to losses on Wall Street ahead of the government jobs report. Dow futures were down 31 points, or 0.4 percent, at 8,665, and S&P500 futures fell 3.1 points, or 0.4 percent, to 902.90. Oil prices recovered moderately, with light, sweet crude for February delivery up 24 cents to $41.94 a barrel in electronic trading on the New York Mercantile Exchange by midday in Singapore. The contract overnight fell 93 cents to settle at $41.70. In currencies, the dollar slipped to 91.20 yen, down from 91.34 yen, while the euro fell to $1.3654 from $1.3699.